Last night, Amazon share prices surged and Microsoft shares dipped, allowing Jeff Bezos to surpass Bill Gates in new worth, dethroning Emperor Clippy to become the king of the rich nerds for the first time. 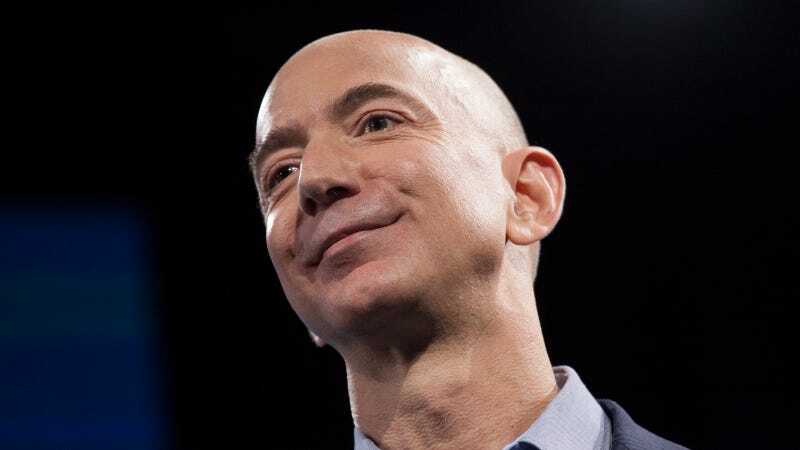 At the close of trading on Wednesday, Bezos—CEO of Amazon, owner of The Washington Post, and founder of Blue Origin commercial space company—had a net worth of more than $89 billion, while Microsoft co-founder Bill Gates was worth more than $90 billion. But overnight, Amazon’s share price surged to more than $15 a share, meaning Bezos, who has around 80 million shares in Amazon, earned about $800 million while you were sleeping, according to CNBC and Bloomberg. There’s a slight chance that Microsoft and Amazon stock fluctuations could put Gates back in the lead by tonight, but Bezos’ mountain of coins is only expected to grow over the next few days. Bezos just made it to second-richest person on the planet last March. He’s the seventh person to hold the title since Forbes started tracking billionaires in 1987. Gates became the richest person in the world in 1995. Mexican telecom mogul Carlos Slim bumped him down a spot in 2010, but Gates made it to the top again in 2013. Bezos has been acting extra confident lately, strutting around like a jacked assassin trying to fit in at a tech conference and chilling in a camping chair on top of Blue Origin’s new 750,000-square-foot orbital launch facility in his Instagram debut yesterday. You’ve come a long way, Jeff. We can’t wait to see what the future has in store for you. Oh, the places you’ll go. Update: Amazon reported its second quarter earnings Thursday afternoon, showing its stocks had simmered down, which bumped Bezos back down to second place.